Sun City offers premium accommodation with a distinct Aztec-inspired feel in the heart of Surfers Paradise. From its unique décor and architectural motifs, such as the pyramid feature in the swimming lagoon, to tasty Mexican cuisines in Sayas Restaurant, the Aztec influence provides a special sense of fun perfectly suited to the Gold Coast. Just a short stroll to Surfers Paradise Beach and the cosmopolitan hub of Cavill Avenue, Sun City is perfect for couples and families seeking privacy and comfort close to the action. Accommodation options range from hotel rooms to self-contained two and three-bedroom apartments and penthouses, most with panoramic ocean or hinterland views. 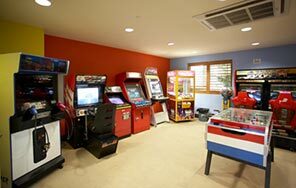 Sun City’s extensive facilities include a heated indoor pool, outdoor lagoon pool with it's own beach and waterslides, spa, sauna and steam room, tennis court, games room, fitness centre and Sayas Restaurant Café Bar. Accommodation options at Sun City range from hotel rooms to self-contained two and three-bedroom apartments and penthouses, most with panoramic ocean and/ or hinterland views. All accommodation types feature Aztec-inspired décor and facilities including cable TV and private balconies in most rooms. All apartments and penthouses offer the added convenience and comfort of fully-equipped kitchen, laundry facilities and private balconies. Available with 1 king or 2 single beds. Features a private balcony (floors 1  17 only). Available with 1 king or 2 single beds. Features full kitchen facilities, full laundry facilities, bathtub in most bathrooms and a private balcony. Available with 1 king + 2 single beds. Features full kitchen facilities, full laundry facilities, bathtub in most bathrooms and a private balcony. Available with 1 king + 2 single beds + 1 sofa bed. Features full kitchen facilities, full laundry facilities, bathtub in most bathrooms and a private balcony. Available with 1 king + 4 single beds. Features full kitchen facilities, full laundry facilities, bathtub in most bathrooms and a private balcony. Available with 1 king + 1 double and 2 single beds. Features full kitchen facilities, full laundry facilities, bathtub in most bathrooms and 2 private balconies featuring a large entertaining area. Room service: Dinner (5.00pm  9.00pm). Sayas Poolside Cafe & Bar lunchtime dining venue the will close from Monday to Friday, opening for normal buisness 11am to 5pm on Saturday and Sunday only, until advised otherwise. 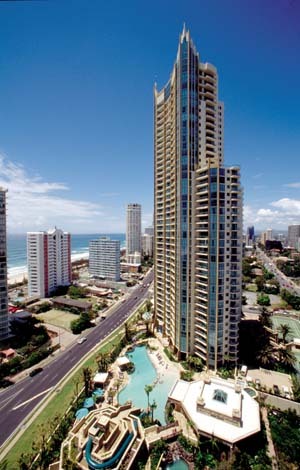 Ocean Avenue., Surfers Paradise, Queensland. 4217 Australia.